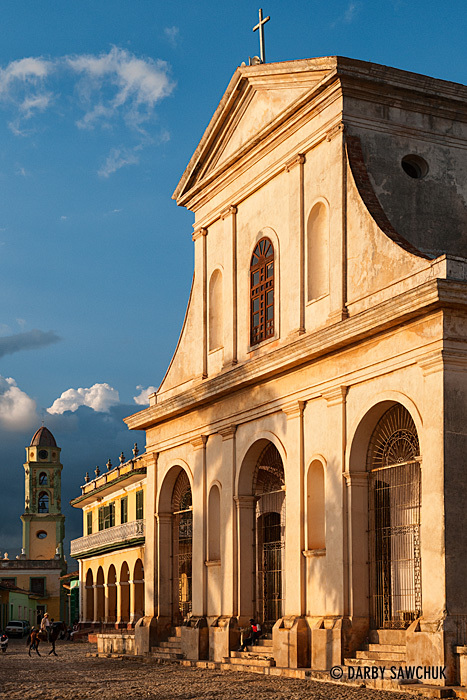 Part I of my photos of Cuba showed off Havana, but as Cubans outside of the nation’s Capital are quick to tell you, there’s much more to their country. The lush farms of Vinales are overlooked by surreal mogotes the seem almost purpose built for climbers. Waterfalls cascade through hillside jungles on a path to sparkling blue seas that abut pristine beaches and invite snorkelers and divers to jump in. 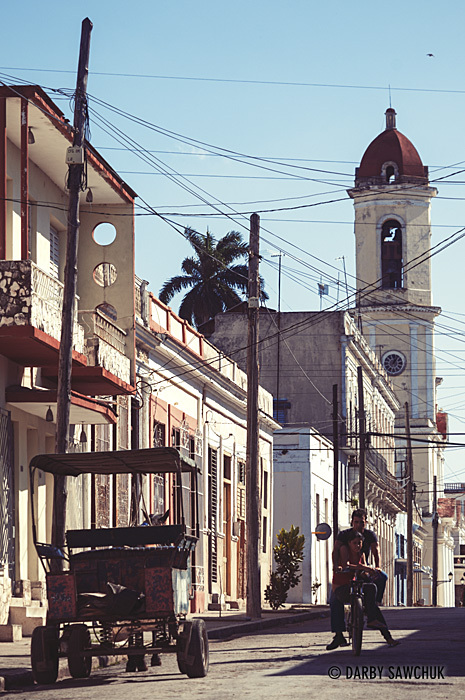 Cities that feel like towns show off their own distinct characters through their own spins on Cuba’s heterogeneous architecture. 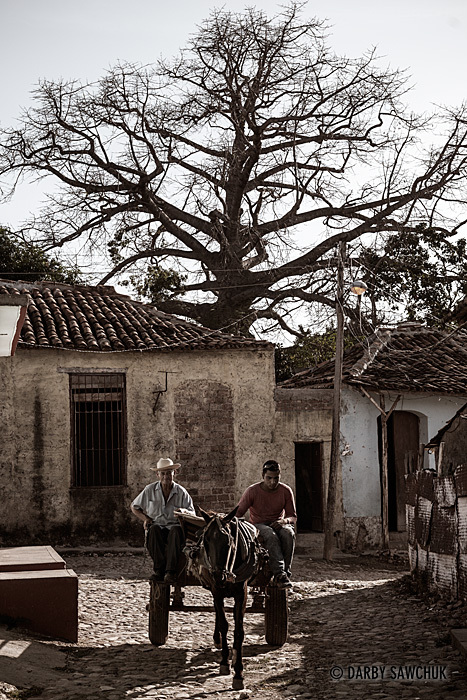 The following photos capture scenes from Vinales, Cienfuegos and Trinidad, Cuba. 38. 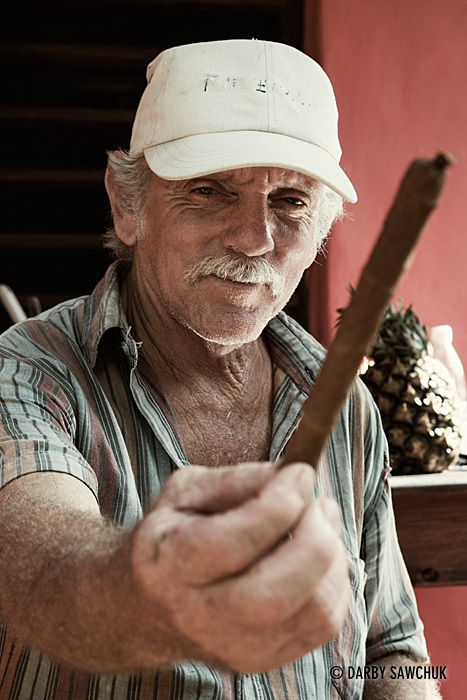 A Cuban farmer shows off a hand-rolled cigar in Vinales, Cuba. 39. 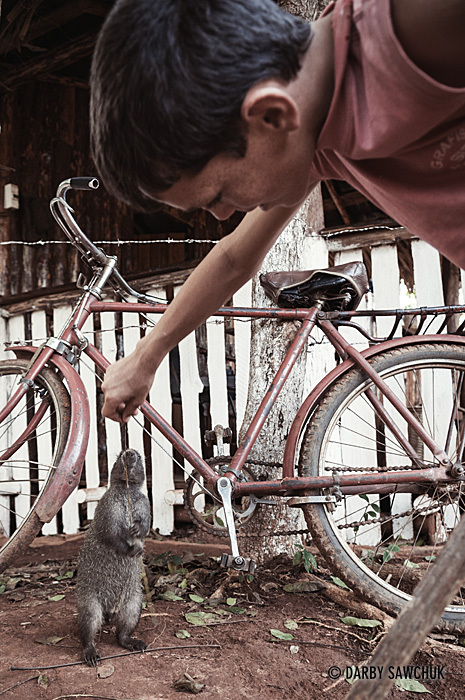 A Cuban boy plays with a hutia (known as a jutia in Cuba) in Vinales, Cuba. The jutia is sometimes also known as a banana rat or a tree rat and Cubans have been known to cook them with nuts and honey. 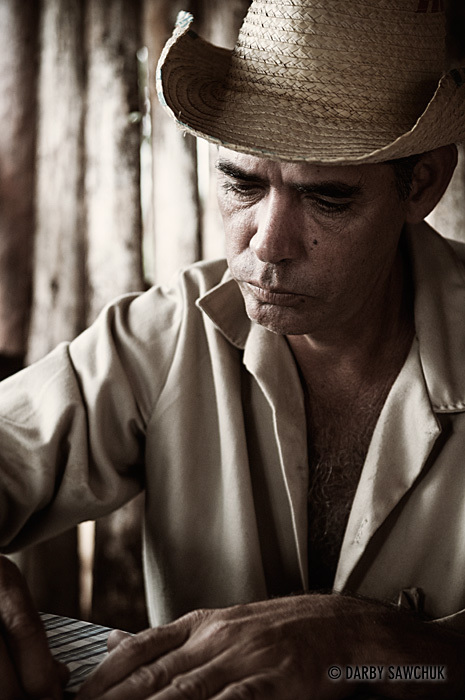 41.A Cuban farmer in Vinales, Cuba. 42. 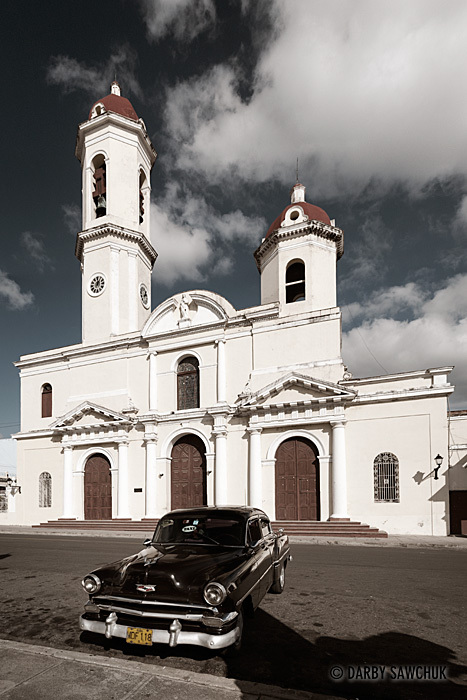 A classic American car is parked in front of the Cathedral of the Immaculate Conception (Cathedral de le Purisima Concepcion) in Central Cienfuegos, Cuba. 44. 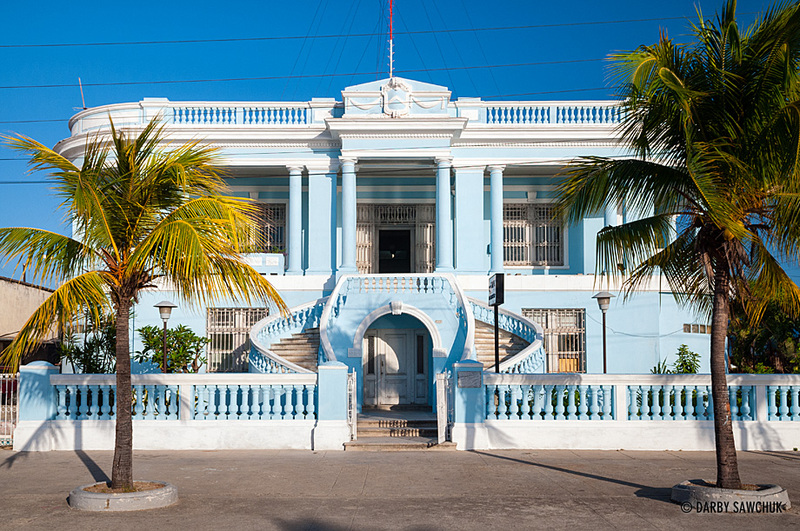 Radio Ciudad del Mar now occupies one of Cienfuegos’ classical French buildings. 45. 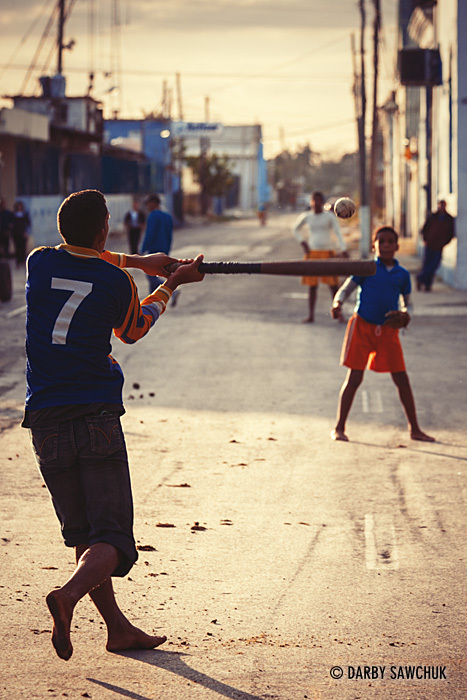 Children play baseball in the streets of Cienfuegos, Cuba. 46. 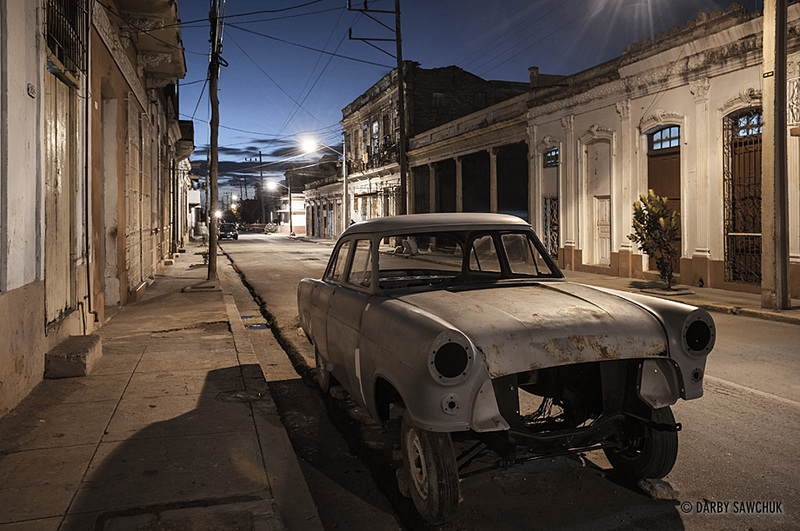 A dismantled classic American car in the streets of Cienfuegos at night. 47. 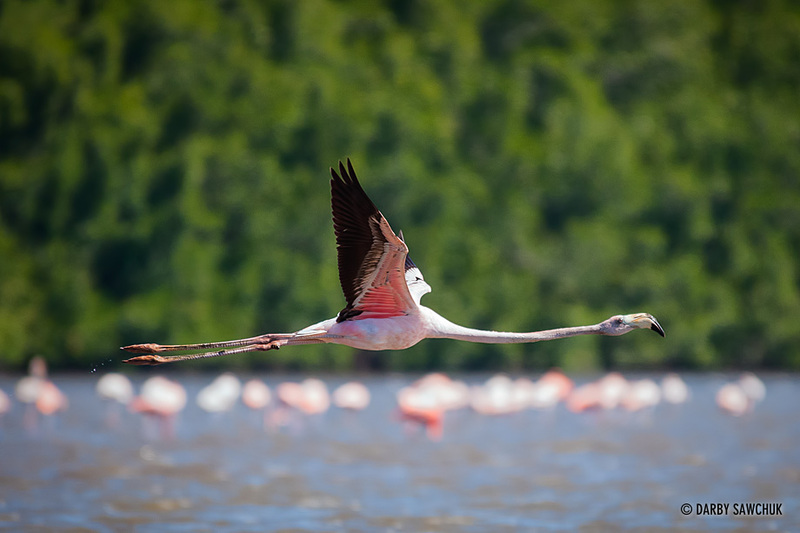 A flamingo in flight at the salt-water Laguna Guanaroca near Cienfuegos, Cuba. 48. 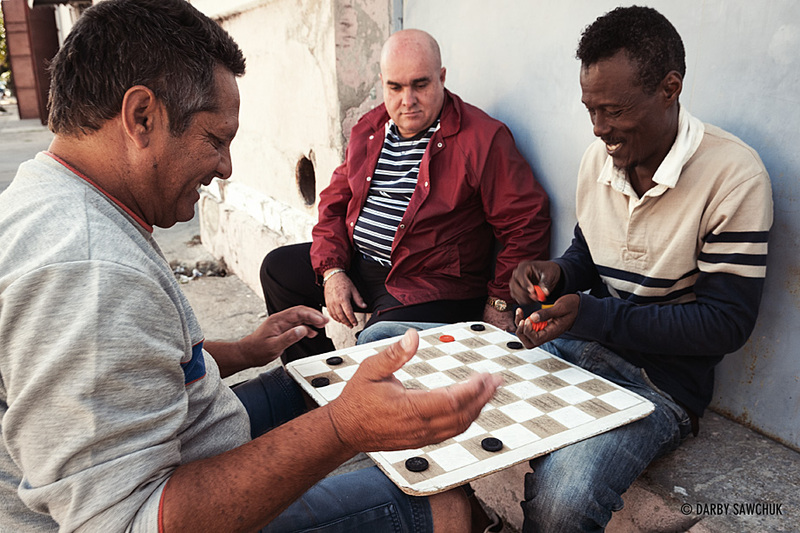 Men play checkers in the streets of Cienfuegos, Cuba. 49. A couple ride double on a bike through the streets of Cienfuegos, Cuba. 50. 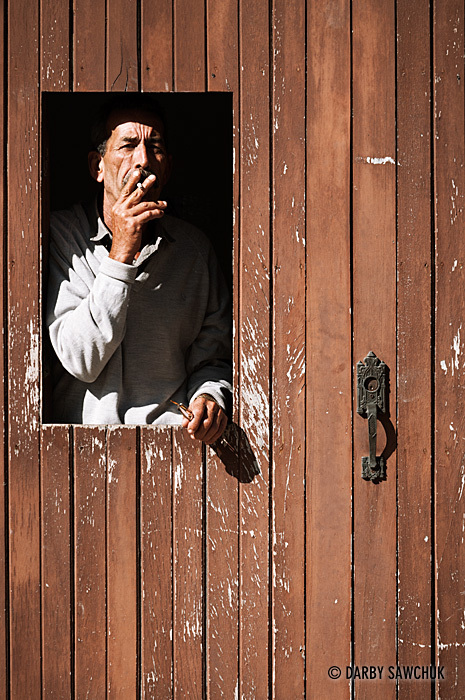 A cuban man smokes a cigarette through an opening in the door to his shop in Cienfuegos, Cuba. 51. 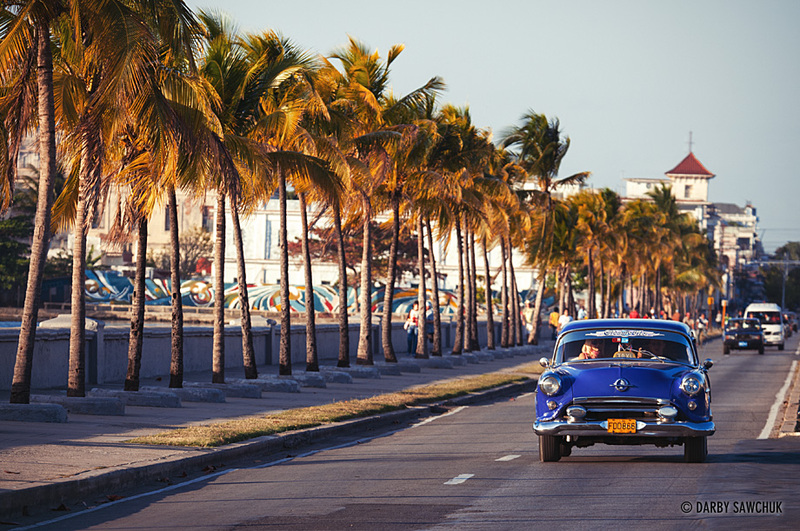 A vintage American car drives up Cienfuegos’ version of Havana’s Malecon: Paseo del Prado. 52. 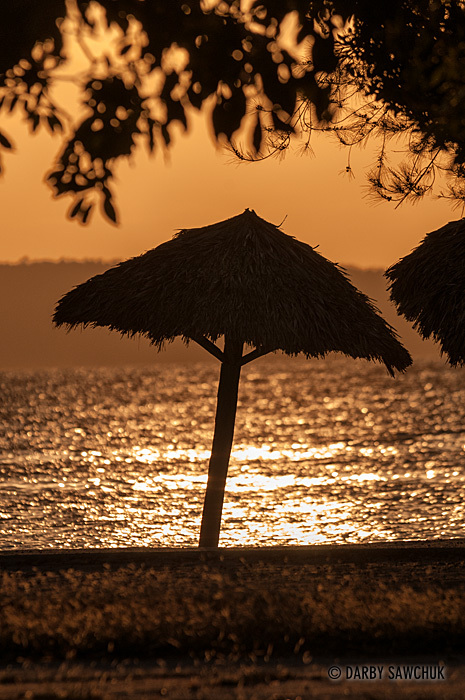 A thatched umbrella on a small beach in the Punta Gorda district of Cienfuegos, Cuba. 54. 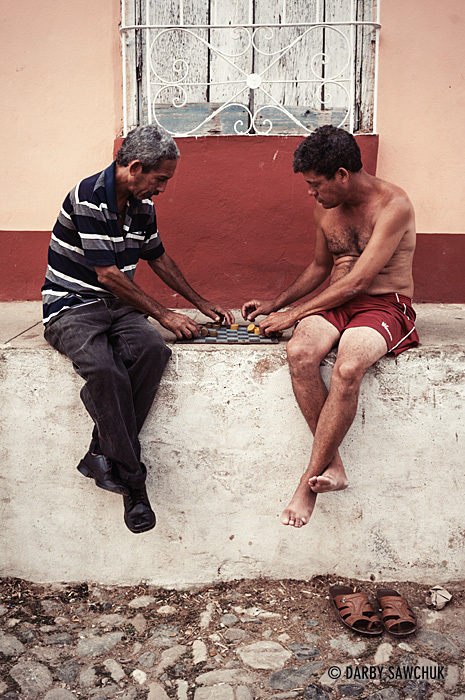 Men set up a game of checkers using bottle caps as playing pieces in Trinidad, Cuba. 55. 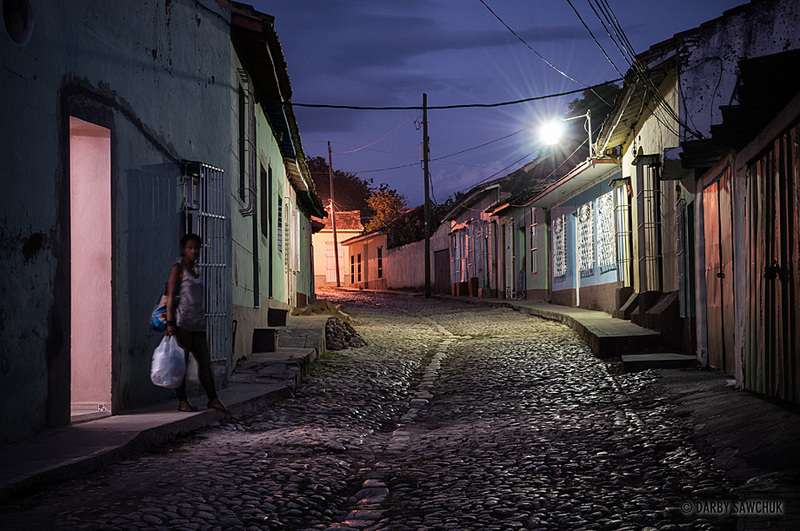 A woman carries groceris through the cobblestoned streets of Trinidad, Cuba at night. 56. 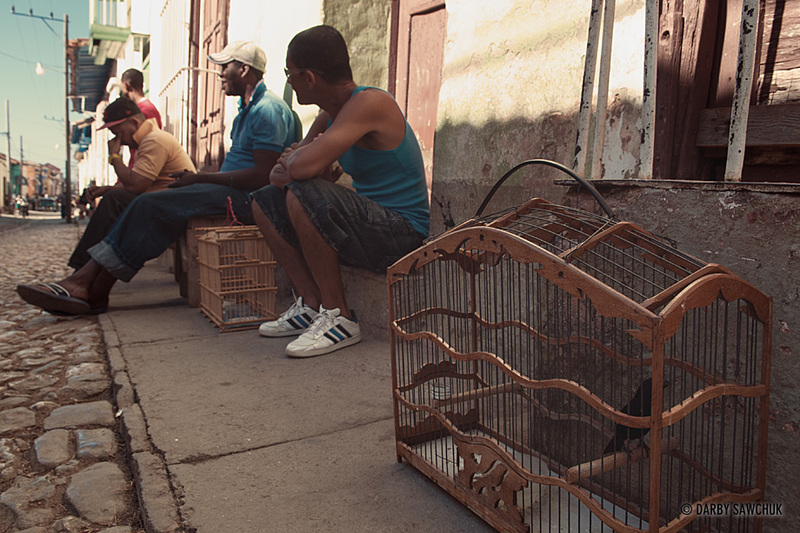 Men sit with their caged birds in the streets of Trinindad, Cuba. 57. 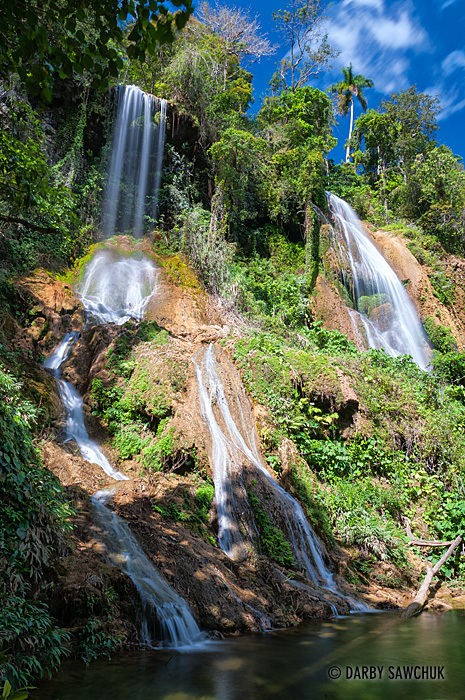 The El Rocio waterfall in Parque Guanayara in Topes de Collantes near Trinidad, Cuba. 58. 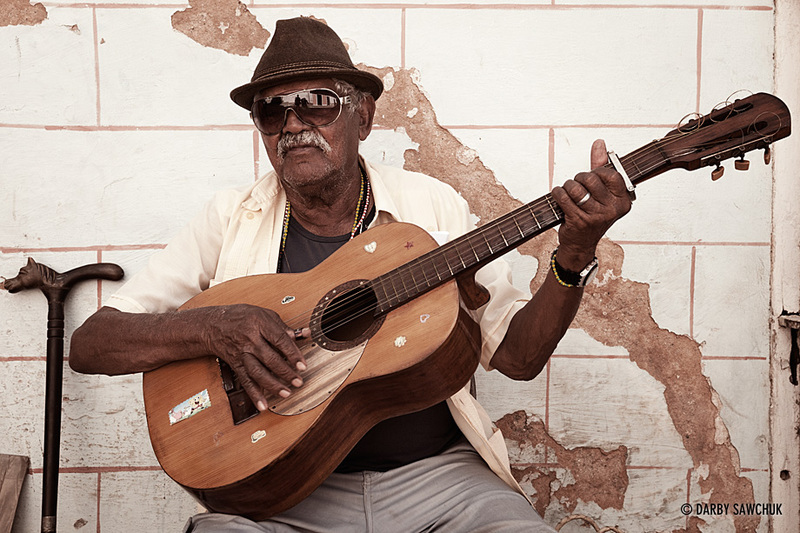 A guitarist plays music in the streets of Havana, Cuba. 59. 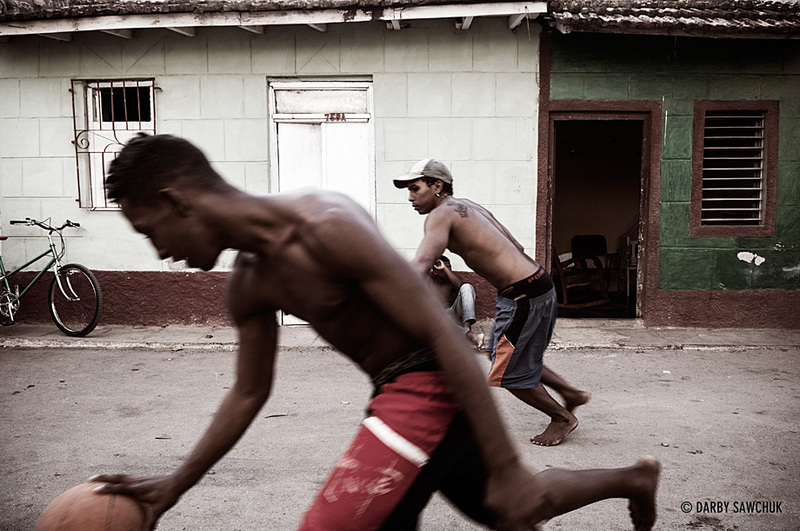 Teens play a game of keep-away basketball in the streets of Trinidad, Cuba. 60. 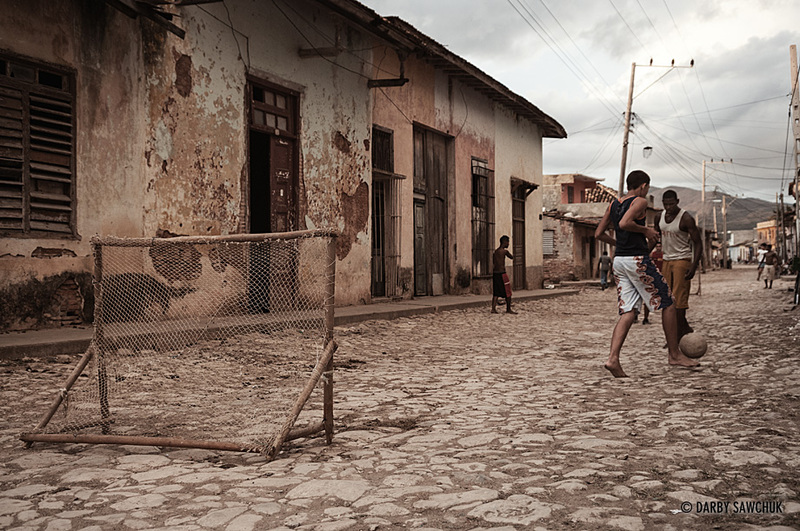 Boys play football in the cobblestone streets of Unesco World Heritage Site Trinidad, Cuba. 61. 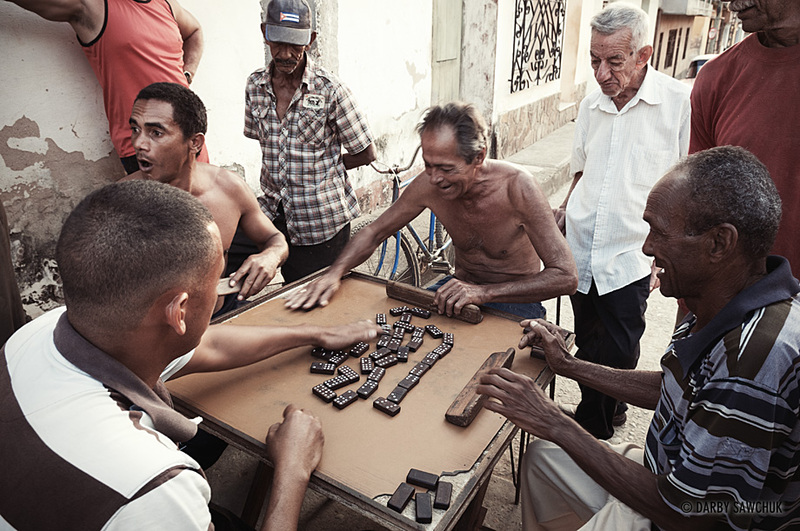 Men finish playing a game of dominoes in the streets of Trinidad, Cuba. 62. 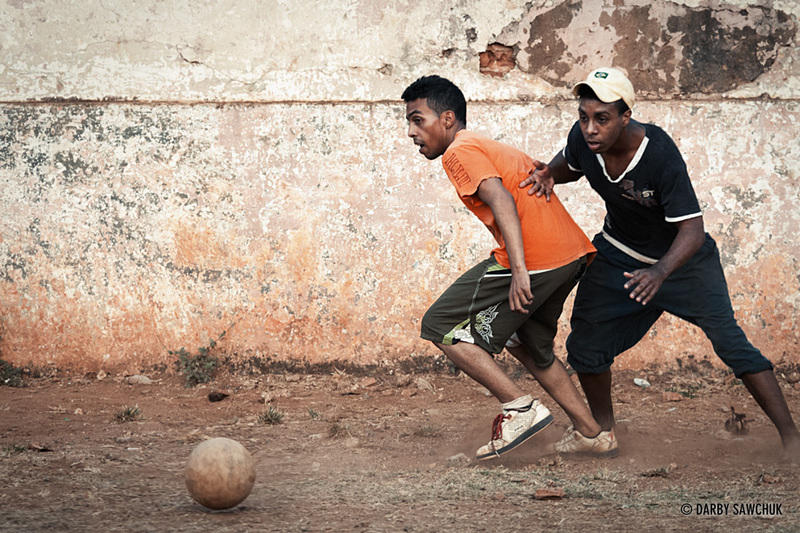 Teens play soccer/football in a dusty schoolyard in Trinidad, Cuba. 63. 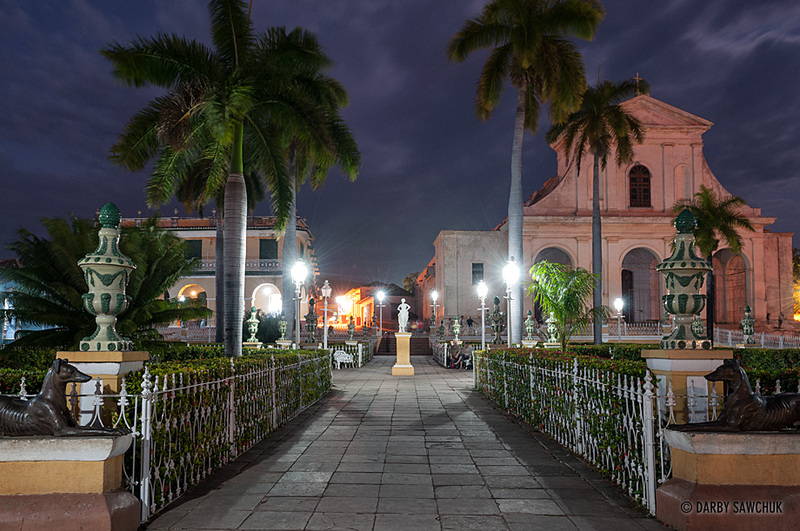 Museo Romantico on the left and the Santísima Trinidad Cathedral on the right at Plaza Mayor at the centre of Trinidad, Cuba at night. 64. 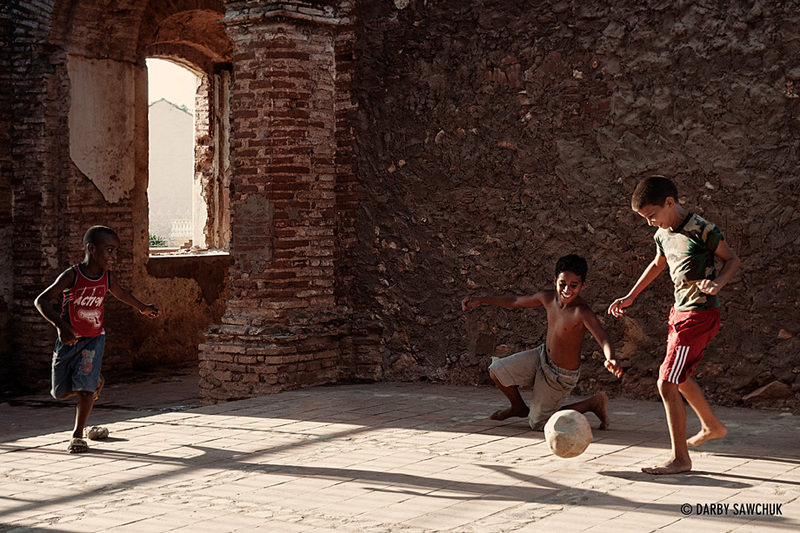 Boys play football in a ruined portion of the Iglesia de Santa Ana in Trinidad, Cuba. 65. 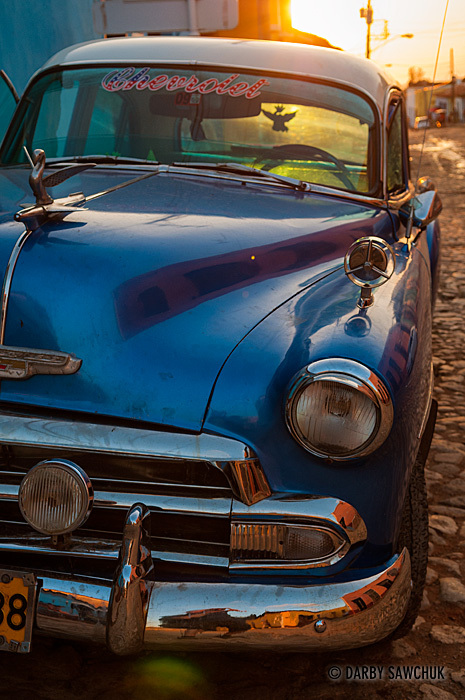 A classic Chevrolet catches the last rays of the sun in Trinindad. 66. 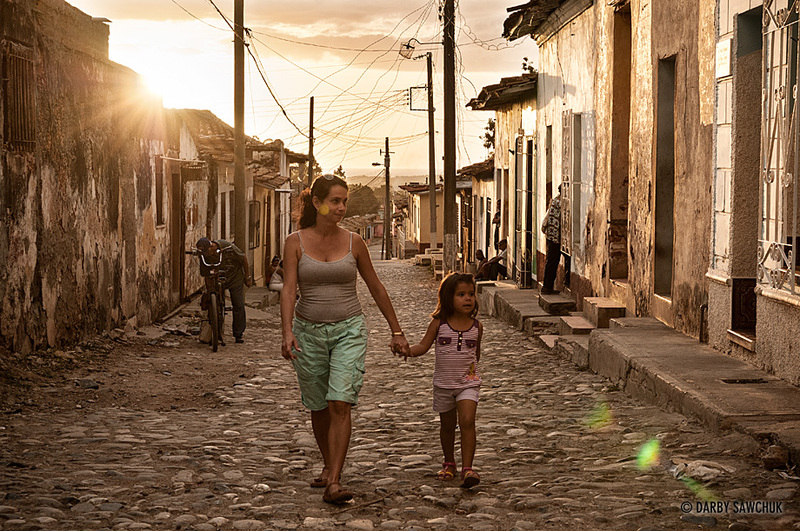 A mother and daughter walk up the cobblestone roads of Trinidad, Cuba. 67. 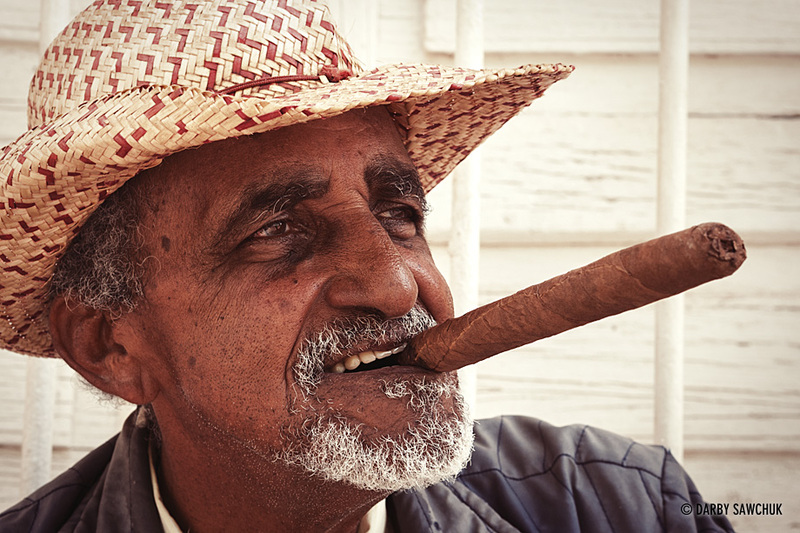 A Cuban man prepares to light a large Cuban cigar in Trinidad, Cuba. 68. 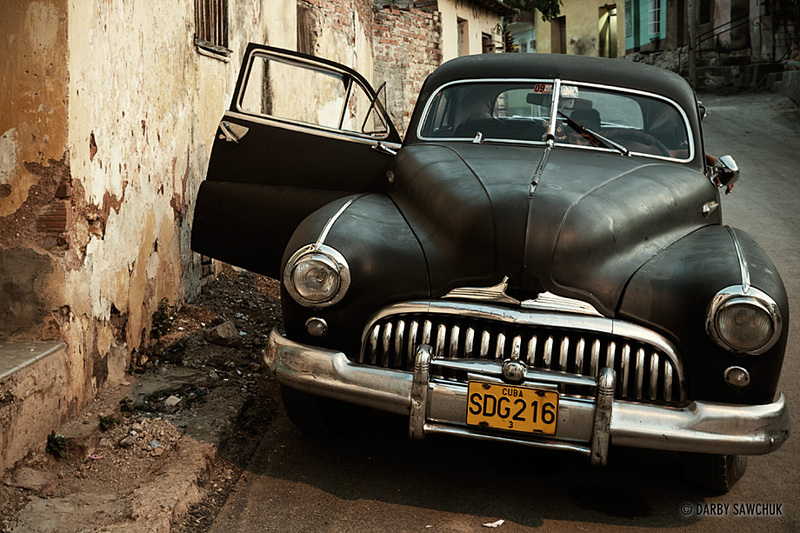 A classic American car in the streets of Trinindad, Cuba. 69. 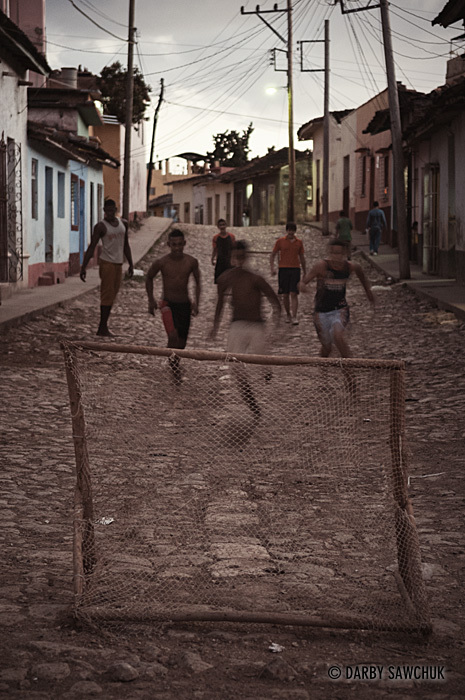 Boys play football on the cobblestone streets of Unesco World Heritage Site Trinidad, Cuba. 70. 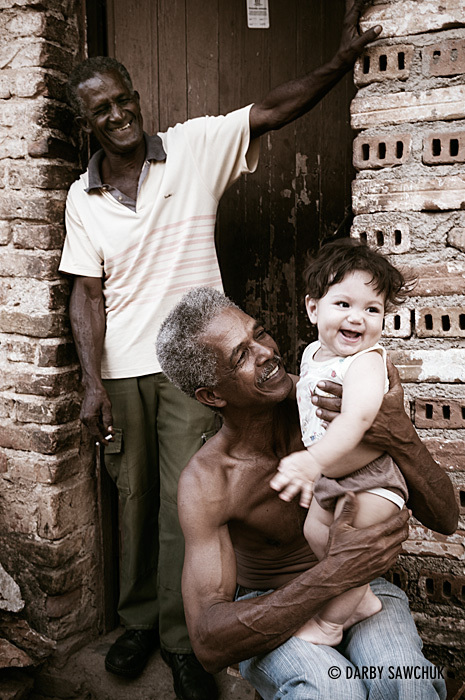 A family plays with a baby in Trinidad, Cuba. 71. 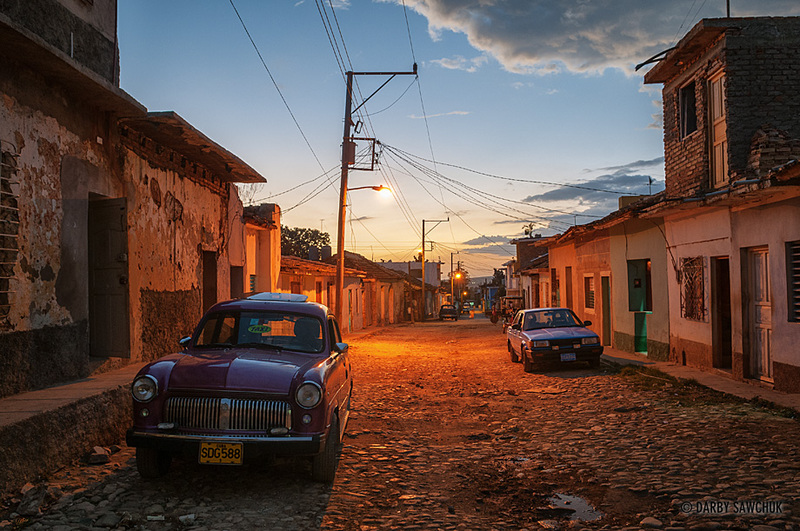 Cars in the streets of Trinindad, Cuba at dusk. 72. Cuban men lead a horse and cart up a street in Trinindad, Cuba. 73. 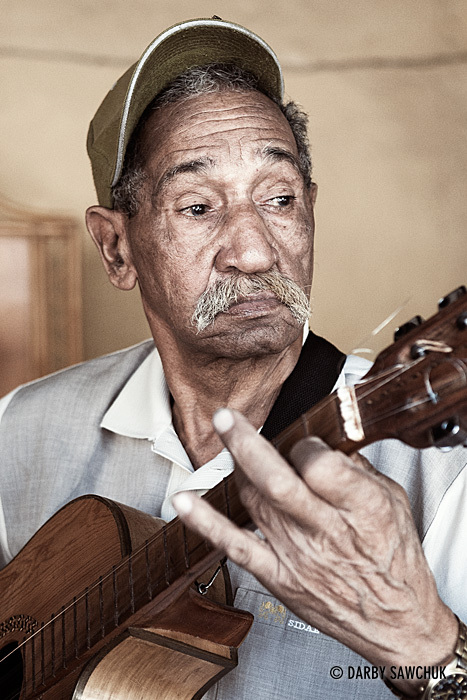 A guitarist plays a song in Trinindad, Cuba. 74. 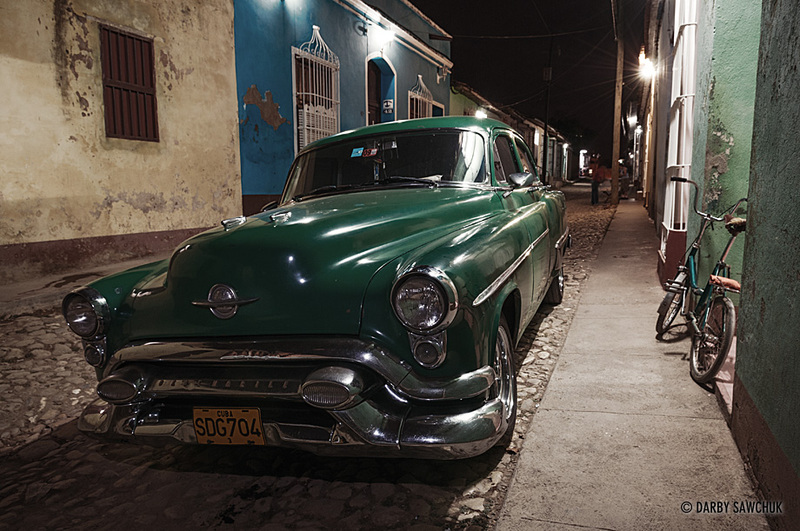 A classic American car at night in the streets of Trinindad, Cuba. 75. The Santísima Trinidad Cathedral (Iglesia Parroquial de la Santisma Trinidad) in the late-afternoon light with the San Francisco Monastery (Iglesia y Convento de San Francisco) in the background. Keywords: photos of cuba, images of cuba, pictures of cuba, architectural photography, landscape photography, travel photography, street photography, fine art prints, stock photography, photos of trinidad, photos of cienfuegos, photos of vinales.